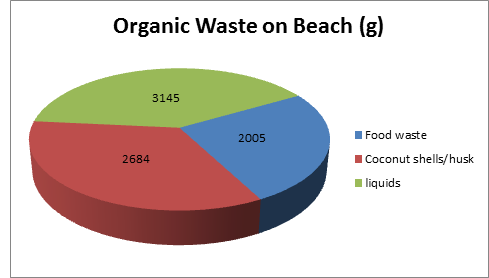 A total of three sample sites was selected on the East beach, which is the most commonly used beach by picnickers. One (Site 1) from the main area under the trees where people choose to camp under the shade, one (Site 2) from near and containing bushes (Heylhifah), one (Site 3) from one of the swimming areas itself. It was noticed that there was less garbage and waste than there was on the 15th of December. It could have been due the fact that it was a rainy week (it rained four days in the week) and there could have been less people visiting the beach because of the rain. It was also very windy which caused light plastics and food wrappers to be blown away to one side of the beach. It took much less time than anticipated, so it was possible to oversee all three audits for accuracy in weighing and to minimize any differences in sorting. Site 1 – 100×100 Ft, or 10,000sq feet. It was very windy on the East at the times of collection. It took less than an hour to collect all the waste by 6 volunteers. Auditing was done by 4 volunteers for this site. Site 2 – 95×71 Ft, or 6745 sq feet. This area included mostly bush and little beach. Since the bush had been cleaned on the 15th Saturday, collection for this site too was easier than we had expected. 6 – 7 volunteers collected from this site in less than an hour. Audit was done by 4 volunteers. Site 3 – 100×100 Ft, or 10,000 sq feet. There was more garbage collected from this site than in the previous week. Most of the garbage was covered in green weed, which means that most of the garbage had been in the sea for some time. The garbage would have had to come with the currents as there is no explanation for the lengthy time it had been under water. Collection was done by 4 volunteers in a matter of one hour. Audit was done by 3 volunteers. There is not a lot of distance from the shore to the reef at the swimming area on the east. A distance of 100 feet was chosen from the shore line outwards. It is not very deep here and a person can easily touch the bottom of the sea. Volume or density was not found for any of the items. 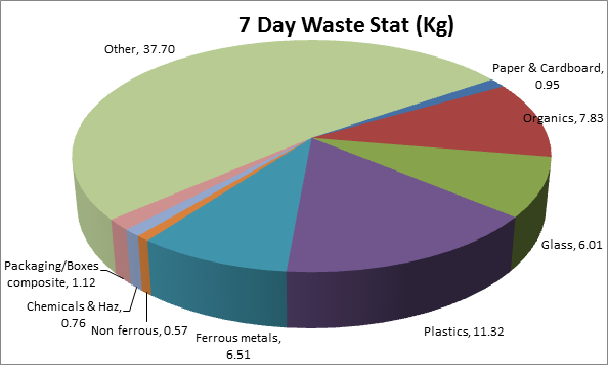 Waste was accumulated over a period of seven days. Much of the organic waste was from leftover food stuffs and waste. There is also a large number of coconut shells which is most likely used for making barbecues. The liquids as seen here come from inside pet bottles, and are mostly water, juices and soft drinks. Most of the plastics on the beach were PET bottles. They were either water, juice or soft drink bottles. There is also a large percentage of foam. Because foam weighs so little, it may appear here as not contributing much in weight to the total, but in fact it takes up a lot of space and is found quite often on the beach. 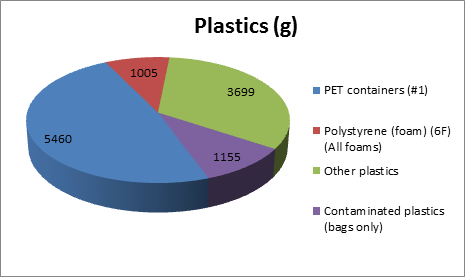 Other plastics include those materials which do not have a recycle number on it. Most of it was empty bottles of shampoo, detergent and packaging plastics. There is also a large number of used and contaminated plastic bags on the beach. 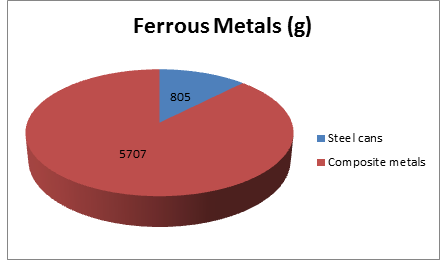 Ferrous metals include those containing iron and are heavier than non-ferrous metals such as aluminum. Fish cans were one of the most common ferrous items found on the beach. There were also other metals like roofing sheets, iron bars, angles and other construction related items found on the beach. Aluminum cans are also found in large numbers on the beach. 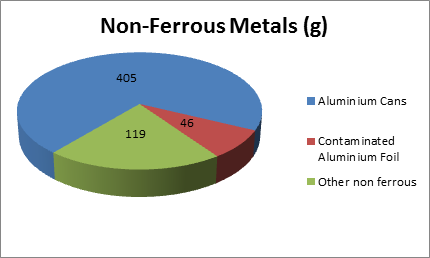 There is also a lot of waste aluminum foil used in barbecues. There were more aluminum cans belonging to different drinks than there were steel fish cans. The only hazardous waste found on the beach within the week were batteries, nappies and sanitary pads. Composites include those packaging made with more than one material. These items cannot usually be recycled. 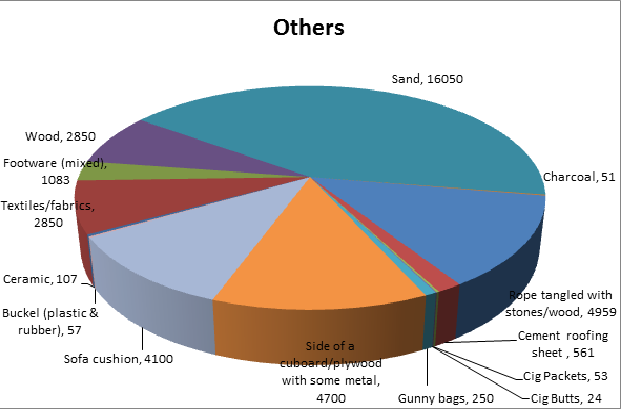 Considering the size and negligible weight of sweet and supari packets, the pie chart representation of how much it contributes in weight, cannot show the real number of supari packets on the beach. 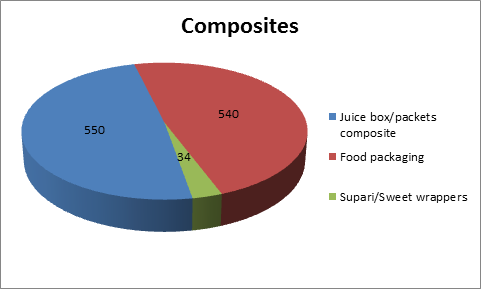 There were more numbers of supari packets than other food packaging. There were very few pieces of broken glass found. 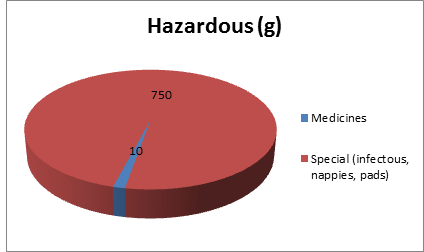 At the initial cleanup of the sample site on 15 December, 61 grams of mixed cullet was collected compared to 9 grams collected a week later. Juice bottles and food jars accounts for 6 kilos of glass. A very common item found on the beach is foot ware and clothing items. There is also a lot of charcoal left on the beach by barbecue makers which do not get cleaned out. Cigarette butts and packets are also very common. Different types of ropes are also very common, possibly thrown away by passing sea vessels which could have drifted ashore and also from fishing lines. 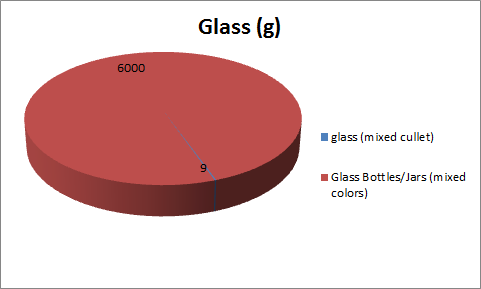 The large portion of sand shown in the pie chart comes from inside PET bottles, plastic bags or packets. Click here to see the PDF file for data collected from all sample sites.